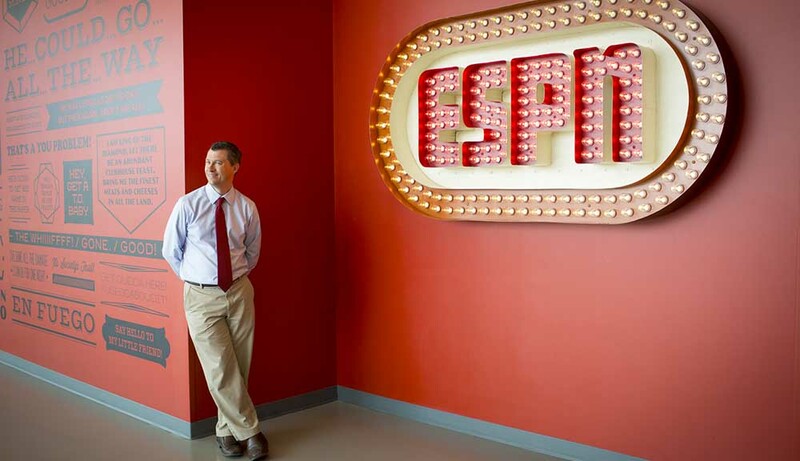 Alumnus Jeff Bennett, an ESPN analyst, turned his passion for sports statistics into a career that has shaped how society thinks about sports. Jeff Bennett’s drive to examine the smallest sports statistic led him to create the sports metrics that are now part of the lexicon of the fans, players, and leadership. I grew up obsessed with sports statistics so I gravitated toward mathematics. That people who work with data see outcomes as black or white. There is a lot of gray in the world. There are times when I’m explaining a sports analytics concept to someone very interested but clearly hasn’t given the question or problem much thought. When I see them light up with understanding, that makes me feel like I am increasing someone’s understanding of sports. ...have the best job in the world. When our team creates new sports metrics, we are helping people understand sports better and shaping the national sports conversation. But I am fully aware this is done to entertain people and I am not saving any lives. At WPI, I learned how to work on projects, be a part of a team, and communicate results clearly. That serves me well almost daily. Read more about Jeff in the Summer 2016 issue of the WPI Journal.